If you have a relentlessly inquisitive dog and/or cat, you know that the Christmas holiday season can be a time of great temptation for them – and a source of frustration for you as you fend off attacks on breakable ornaments and the Christmas tree itself. You probably learned long ago not to hang your most valuable ornaments on the low branches where Fido the dog or Frisky the cat can bat at them or gnaw on them. The last thing you want to deal with at this busy time of year is a pet who’s choked on a bright little bauble or gotten sick nibbling on an irresistible holiday treat meant for human consumption only. Here are a few tips to keep in mind as the holidays approach. It’s difficult to keep a determined dog or cat from invading your carefully trimmed and decorated Christmas tree, but there are a few reliable measures that can help protect your furry friend from injury. Eliminate ornaments with anything that dangles – no cat can resist the urge to go after it. Make minimal use of tinsel and garland, which small animals love to chew on (or restrict it to the higher branches). Same goes for lights, which present a potentially lethal threat to a pet who just has to chew on something. If you don’t mind repeatedly chasing your determined little friend away from the tree, consider putting down a layer of tin foil so you’ll hear when he’s up to no good. ‘Tis the season for chocolate in all its many forms. If you plan to whip up a batch of buckeyes or keep Hershey’s Kisses or chocolate Santas lying around, keep them safely put away in a cabinet or the fridge unless you’re able to police them. Chocolate can have a poisonous effect on a pet’s system. Often, it just amounts to some diarrhea or vomiting (probably on your nice, clean living room carpet). However, if your pet has a hearty appetite, large amounts of chocolate can cause seizures, internal bleeding and even damage his heart (the chemical theobromine is the culprit). Do your little pal a favor this Christmas and stick with white chocolate, which has much lower levels of theobromine. Pay careful attention to the kinds of ornaments you’re using. Avoid hanging glass or brittle plastic ornaments that may split or shatter and leave splinters that could get stuck in a paw or, worse, in your pet’s gumline. 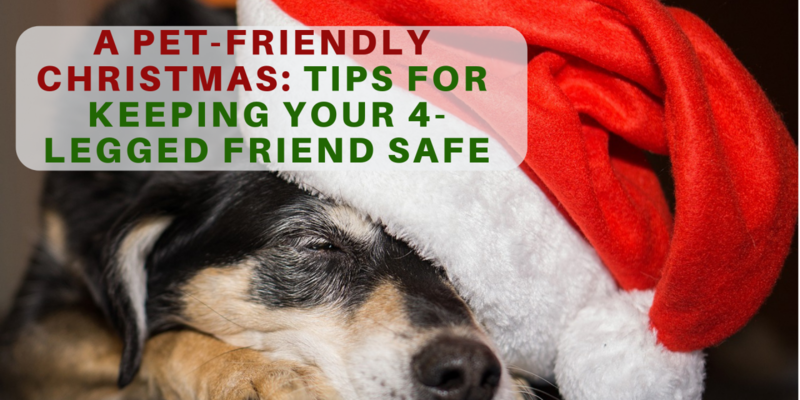 Opt for hard plastic ornaments or some other material your 4-legged pal can’t damage. Expensive decorations made of china, porcelain, or glass probably aren’t great ideas if the family pet has a knack for getting into trouble. Look for decorations made of wood or plastic – they may not always be the prettiest, but you can rest easy knowing they won’t break or shatter. Families tend to remain faithful year in and year out to a fake or live tree, depending on family tradition. If your family demands a live tree, be diligent about keeping pine needles vacuumed. They tend to get quite brittle over time and can produce stomach pain, damage the lining of the stomach, or get caught in their intestines, a painful condition that’s guaranteed to put a damper on everyone’s Christmas. Be aware that some traditional holiday plants, such as poinsettias, holly, and mistletoe, are toxic to cats and dogs. Keeping the family pet safe through the holidays is a matter of preparation and careful attention to detail. It also helps to know your pet – if he’s incorrigibly curious, keep potentially dangerous ornaments, decorations and plants put away and well out of reach, and go easy on the chocolate.